Five years ago today, I grafted a tiny Lophophora williamsii (SB 854; Starr Co, Tx) seedling onto a robust Trichocereus pachanoi stock. 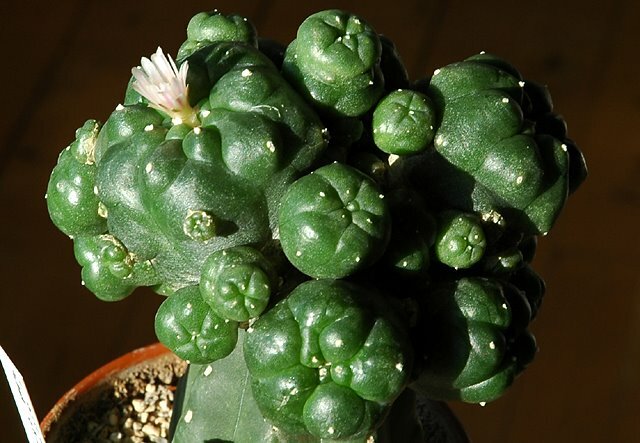 The Lophophora scion has since grown considerably – the main head is approximately 8 cm (~3.2'') wide; the total width including the offshoots now exceeds 14 cm (~5.5''). This growing season the plant hasn't flowered yet but one of the “pups” (new offshoot stems) will do so within days as is evident from the next picture. Unfortunately not only the plants are returning to life after their winter hibernation – the dreaded red spider mites are also fully active again (you should be able to spot at least four mites in the photo above) so the fight is on once more. Even though most of last year's fruits have long since ripened (and been harvested) the odd fruit is still showing. 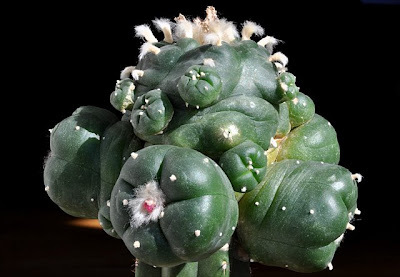 A plant this size gives hundreds of seeds each year making it a virtual seed “factory”. Lophophora williamsii - rib count increasing? The plant seems set on increasing its rib count beyond 8 – if I'm lucky it will not be content with growing just a few more ribs but go straight for the next number in the Fibonacci sequence, 13. 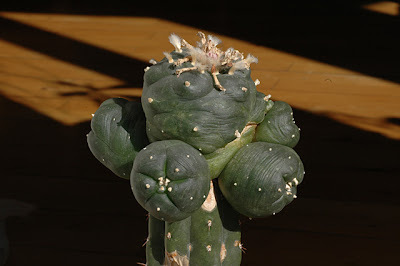 The more ribs the merrier as it means more areoles and consequently more flowers and seeds. 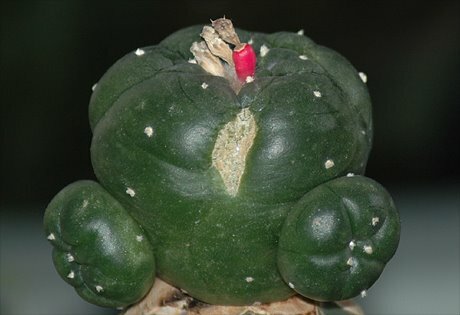 The main head of the grafted Lophophora williamsii has grown 14 pups (15 if you also count a pup's pup – I guess you could call that a grandpup ;-) and has reached a size where it needs to be repotted soon. For comparison you can check the posts on the same graft as one, two, three, and four years old. I've been away on a short vacation and it seems my grafted Lophophora williamsii (SB 854; Starr Co, Tx) has spent its "lone time" wisely and grown three flowers. Even though the flowers were already quite open when I returned home, I decided to attempt a time-lapse video showing the flowers open fully. Unfortunately I forgot to disable the cameras autofocus function which gives the video a shaky appearance as the camera continuously changes focus slightly. 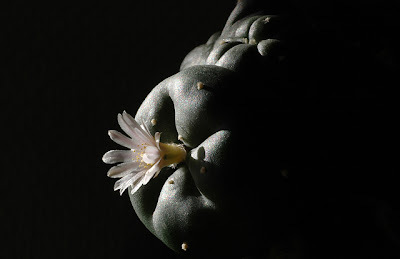 That being said, I'm impressed by the agility of the Lophophora stamens - they seem almost to be dancing around the style. 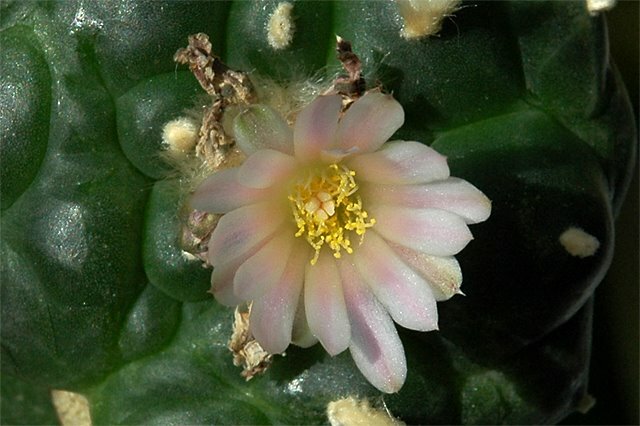 A dazzling display of thigmotropic behavior is shown 50some seconds into the video; the stamens are disturbed and fold rapidly in around the style only to resume their perpetual wiggle shortly after. 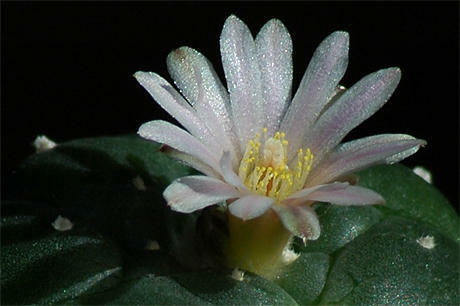 In contrast to this Epithelantha micromeris v. greggii stamens never seem to move during flowering. The photos for the time-lapse were shot at intervals of 15 seconds during a period of 160 minutes. 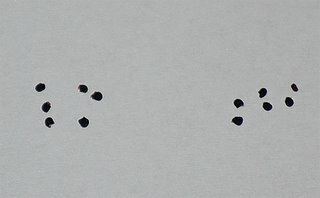 The pictures are played back at a rate of 10 frames per second, i.e. 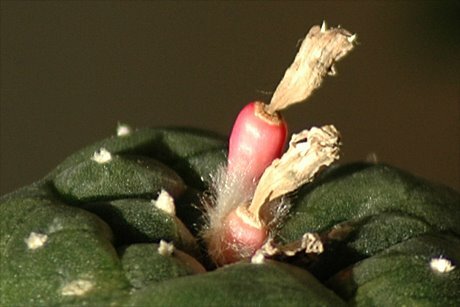 the flowering is speed up by a factor of 150 resulting in a video running for 64 seconds. 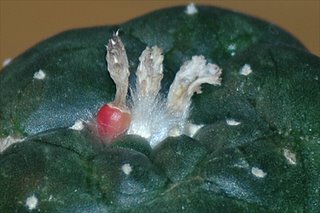 Four years ago today, I grafted a tiny Lophophora williamsii (SB 854; Starr Co, Tx) seedling onto a robust Trichocereus pachanoi stock. 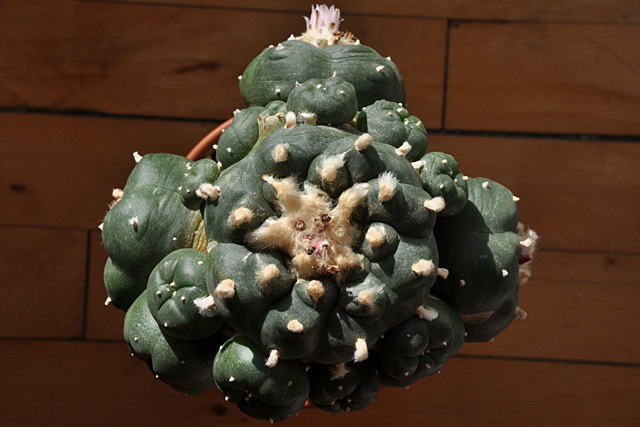 The Lophophora scion has since grown to a width of 8 cm (~3.2'') and set 6 offshoots - the total width including the offshoots exceeds 13 cm (~5.1''). The plant flowered throughout summer last year and many of the resulting seed pods are ready to be harvested. 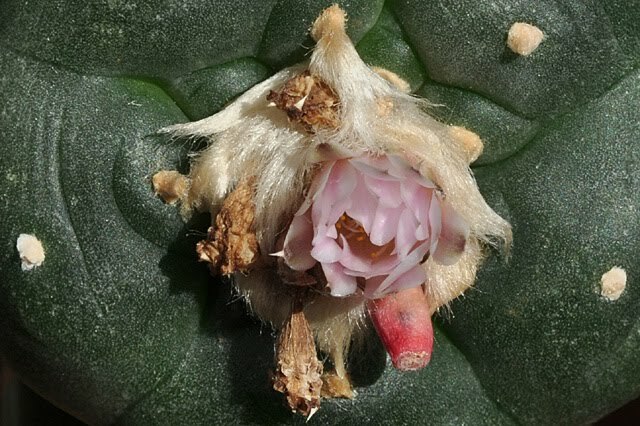 This season's first flower already appeared last week and the remains can be seen in the photo below. 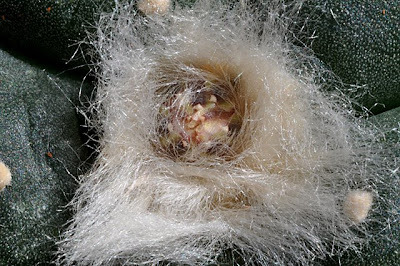 Last year's flowers were allowed to self-pollinate with minimal human intervention. Today I harvested all freely exposed fruits and left the rest to fully mature. So far the result seems good as the plant set a lot of seed, time will show if it is viable. 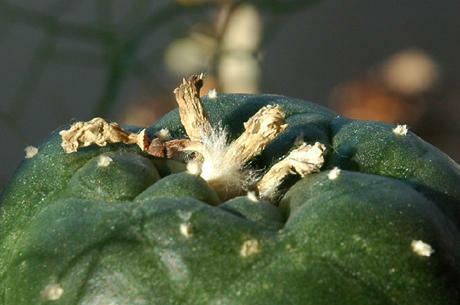 Many of the fruits have a dry and brittle husk that is easily ripped and some of them almost spilled open when harvested. 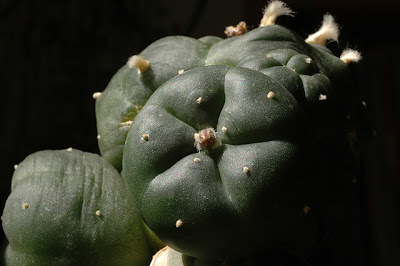 I probably ought to harvest the seeds sooner and not allow the fruits to sit and dry on the plant for too long. 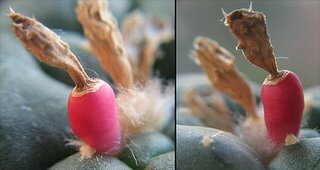 As mentioned the plant has set lots of (selfed) seeds: the initial harvest totalled 101 seeds and there are still a few fruits left on the plant to be harvested later. 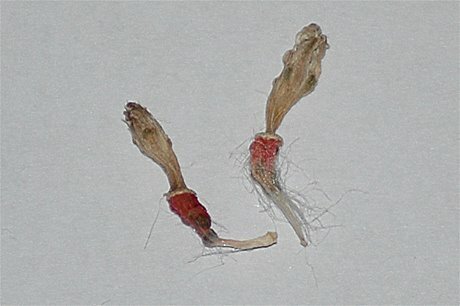 For comparison you can check the posts on the same graft as one, two, and three years old. 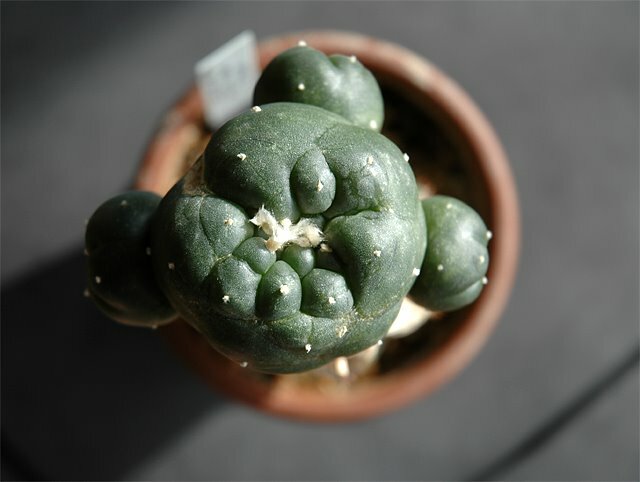 Today one of my Lophophora williamsii (SB 854; Starr Co, Tx) plants is celebrating its 3rd anniversary as a scion grafted onto a Trichocereus pachanoi stock. 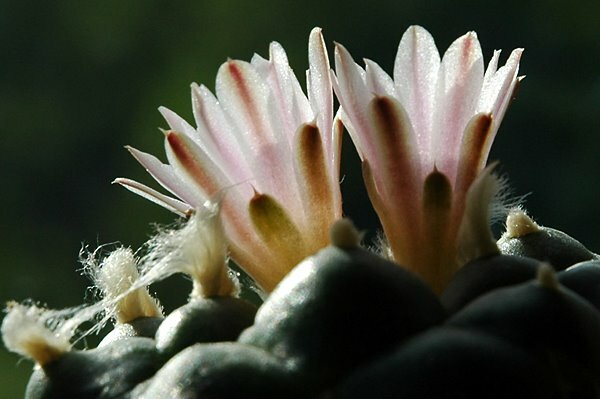 The plant has set 4 offshoots and grown to a width of 7.3 cm (~2.9''), 3 of the offshoots are wider than 4 cm (~1.6'') while the smallest just exceeds 2.5 cm (~1''). The plant set 9 flowers last year and has already displayed two flowers this year. 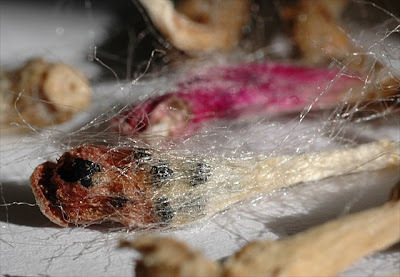 The dried fruits resulting from last season’s flowers are clearly visible in the above photo along with the withered remains of the two “fresh” flowers from this week. The photo below was taken a couple of days ago while the flowers were still at their peak. A couple of days ago a flower bud also appeared on the largest of the offshoots and it will probably bloom within a week; unfortunately I will not be home to witness it. 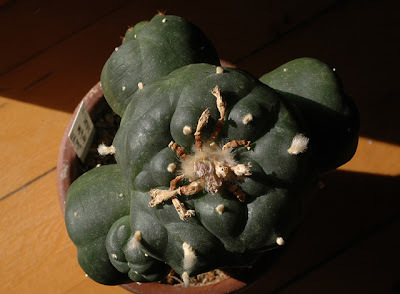 If all the offshoots begin to flower and the main shoot continues to flower in its usual pace, I’ll soon grow more seeds than I’ll ever need. 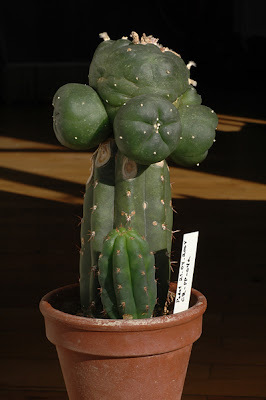 Since last summer the Trichocereus pachanoi stock has also been allowed to grow an offshoot. 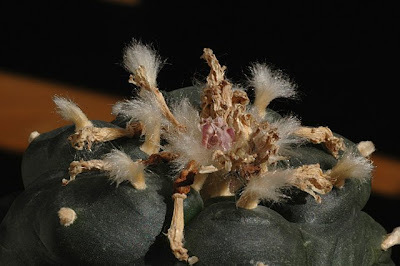 Usually I remove these from stock plants in order not to starve the scion, but this one appeared almost at soil level and I decided to let it grow and later graft one of last years Lophophora williamsii (SB 854; Starr Co, Tx) seedlings onto it (these seedlings are the result of self-pollinating the above plant, i.e. technically they are clones of the mother plant). I had planned to do the graft today, but I’ll leave for the Netherlands tomorrow and decided to postpone doing the graft till I’m back. 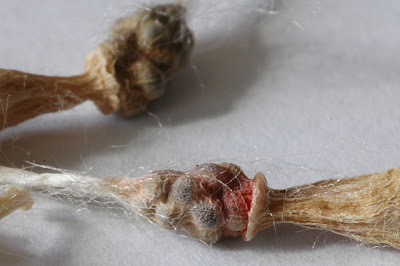 For comparison you can check the posts on the same graft written one and two years ago. 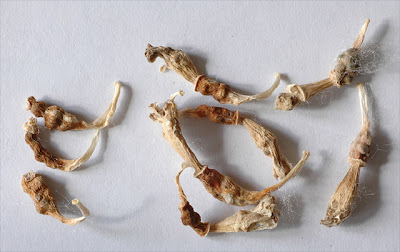 Today I also removed the dried fruits of last season’s flowers and freed the seeds. 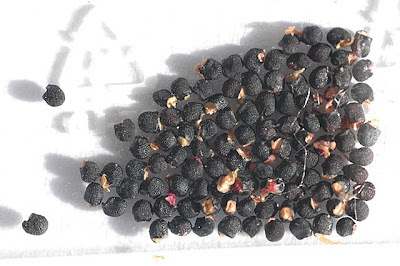 The result of the harvest was approximately 100 seeds. My Lophophora williamsii (SB 854; Starr Co, Tx) graft has gone on a flowering spree and is currently flashing its 7th and 8th flower this season. 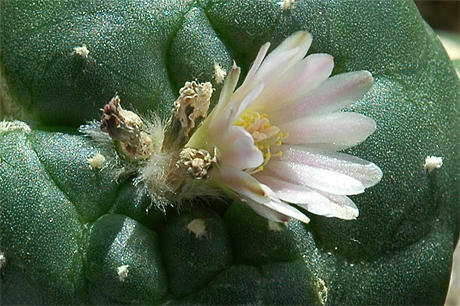 Like other species of Lophophora, L. williamsii has sensitive stamens, closing around the style when touched. 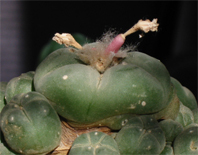 For comparison you can check a photo of thigmotropic behavior in Lophopohora jourdaniana. 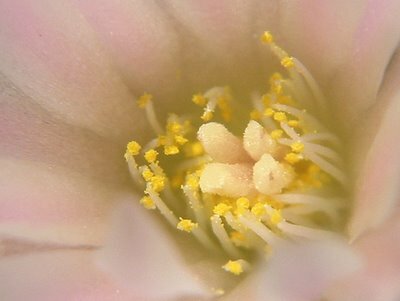 In this case the stamens fold in below the stigmas, apparently not touching them. 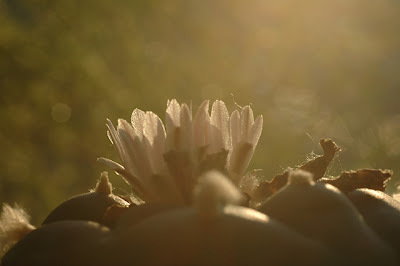 The fruits (or berries, pods, whatever;-) from the plants first two flowers this season have just appeared. I’m looking forward to see how many of the flowers will actually result in a fruit. As mentioned in an earlier post flowering was late this year. My grafted Lophophora williamsii (SB 854; Starr Co, Tx) is now making up for this by showing off its sixth flower this season. 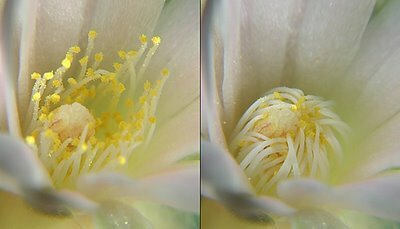 The three previous flowers unfolded while I was away on vacation – the remains of all the spent flowers are visible beneath the current one. 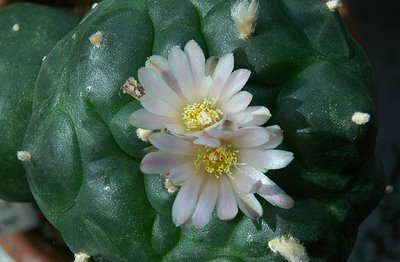 This flowering coincided with the flowering of a Lophophora williamsii v. jourdaniana. 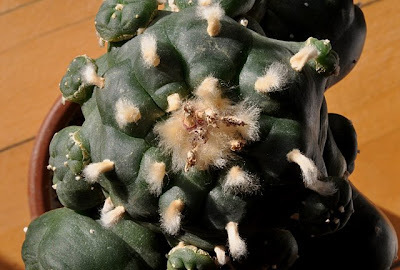 I decided not to outcross the plants but instead self-pollinate both of them; first of all to keep my SB 854’s “clean”, secondly I want to test the alleged self-incompatibility of the jourdaniana variety. 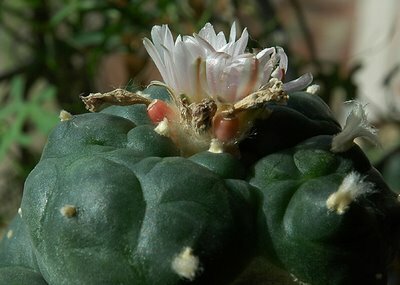 Flowering has been late this year but finally my grafted Lophophora williamsii (SB 854; Starr Co, Tx) decided to come back with a vengeance by setting two flowers simultaneously. 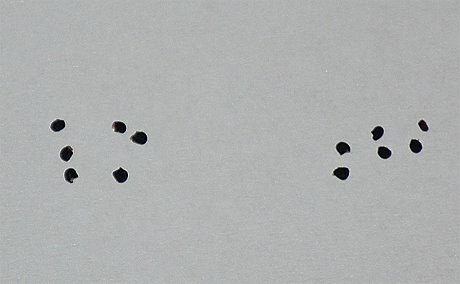 The scar visible in the upper left-hand corner of the photo formed after the epidermis ripped, caused by too vigorous growth. The flowers are funnelform, pinkish white with a light pink midstripe. 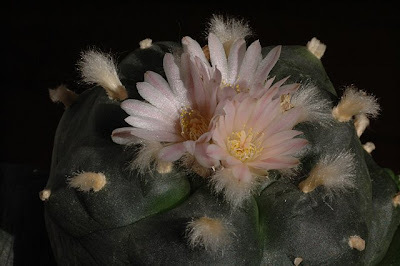 I self-pollinated the flowers but am wondering if it’s necessary – the anthers are virtually brushing the stigmas, depositing pollen without any help. 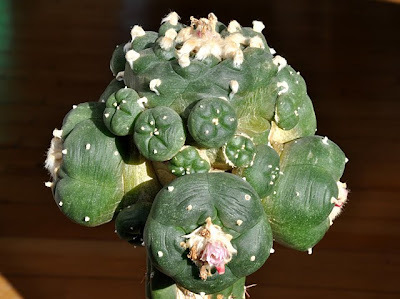 Last growing season I also posted on this plants flowering and fruit setting (use the previous and next links to navigate the posts). 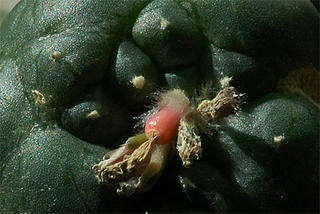 My grafted Lophophora williamsii (SB 854; Starr Co, Tx) is growing its last fruit this season. 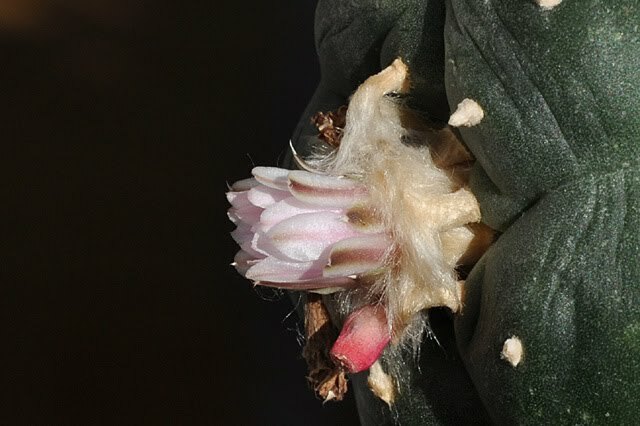 The fruit looks ripe and fat so I'm hoping for lots of seeds even though the flower was self-pollinated. 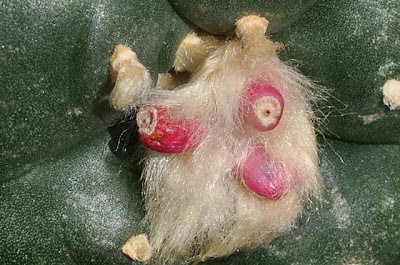 The fruits are approximately 1 cm (~0.4'') long, only the upper half is containing seeds. 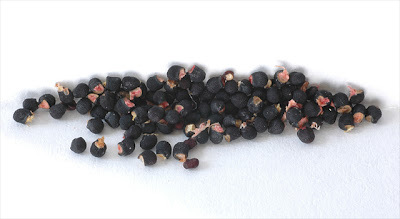 The yield from these fruits, each contained 6 seeds, is much better than from the first fruit I harvested. If the seeds are viable I hope to come full circle, growing new seedlings in less than two years after the mother plant was sown! Most of my plants are now dormant and I hadn’t expected much activity to report on these pages – but 5 days ago I noticed a budding fruit on my grafted Lophophora williamsii (SB 854; Starr Co, Tx). 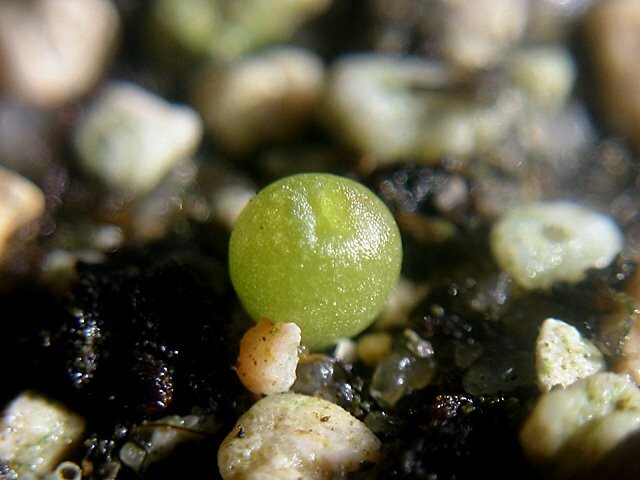 The fruit is now ripe and slightly longer than 1 cm (~ 0.4’’) with a diameter of 4.5 mm (~ 0.2’’) at the widest section. 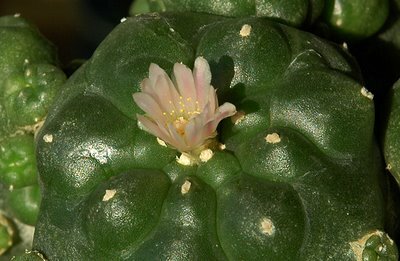 The color is best described as a pinkish magenta segueing into a lighter pink on the surface not directly exposed to the sun. While examining the plant it became apparent that another fruit is breaking out. If this one ripens as abruptly as the last, it will be fully extruded within a week. 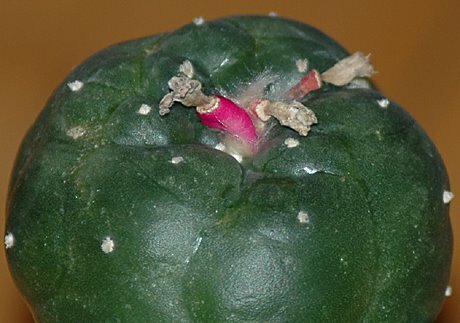 Today I harvested the first seeds from my grafted Lophophora williamsii (SB 854; Starr Co, Tx). The fruit appeared mid-September and has been maturing on the plant for some weeks. The photo below shows the fruit on September 17. 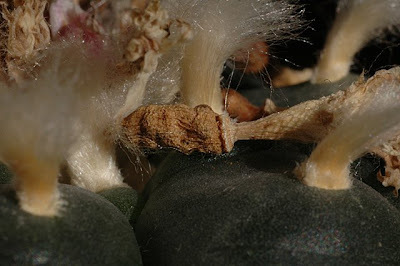 The fruit has been dry and ripe for picking for a while now – as illustrated by the next photo, taken just before the fruit was removed. 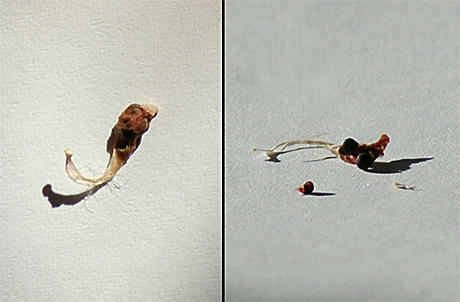 I blame it on the self-fertilization; the fruit only contained 3 seeds that looked OK and 2 that weren’t fully developed. 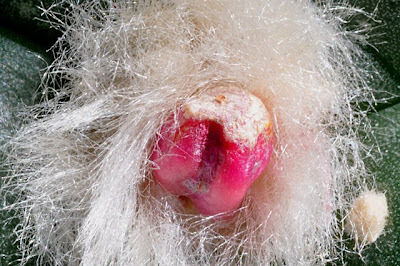 It will be interesting to see if any of the seeds are viable. 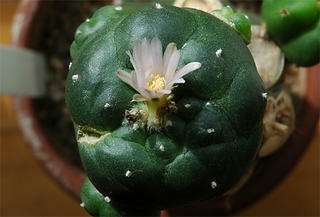 My grafted Lophophora williamsii (SB 854; Starr Co, Tx) is on a roll – it is now flowering for the fourth time this year. I self-pollinated the flower and collected some pollen for a Lophophora williamsii v. jourdaniana that will flower soon – allegedly this variety is self-incompatible i.e. 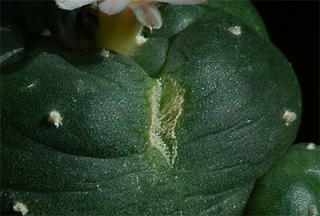 it requires outcross pollination. I hope the pollen will stay viable in the refrigerator for a week or two. 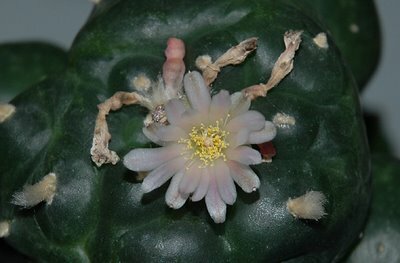 For the third time this year my grafted Lophophora williamsii (SB 854; Starr Co, Tx) is flowering – quite an accomplishment from a plant only 18 months from seed (sowed February 29, 2004). 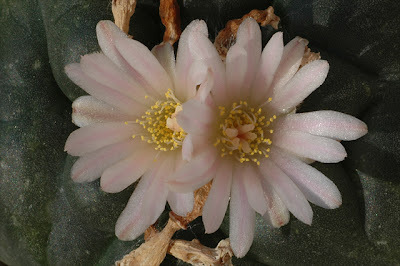 This flower was also self-pollinated. 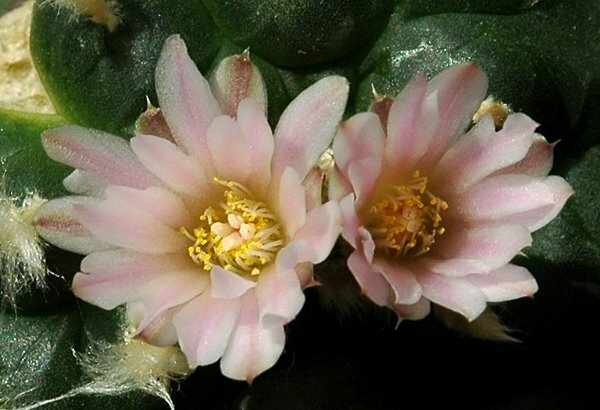 The two spent flowers can be seen below the current one.